Sometimes problems do occur so please get in contact by adding a comment at the bottom of this page and I’ll do my best to try and help. Please remember to use a real email address when you post a comment so that I can get in contact if necessary (your email address will not be visible publicly). What is the Export Location used for? Google have announced that the Picasa Web interface used by the Photo Upload plug-in is being retired on 15 Mar 2019. The expectation is that this plug-in will stop working with Picasa Web at that time. The Photo Upload plug-in now has the Google Photos service available to it (introduced in version 5.0.9 in Sep 2018), which uses the new Google Photos interface instead of the old Picasa Web interface. The Google Photos support in the plug-in has been written from scratch and is quite different to that previously included for Picasa Web. You can purchase a license key for the Google Photos service in this plug-in from the usual places. Unfortunately, due to the time and effort needed to create the new Google Photos support in the plug-in, there is no free transfer or discount when moving from Picasa Web to Google Photos. There are some differences between the new Google Photos interface and the old Picasa Web interface. Most notably you can now use the plug-in to create albums on Google Photos, but note that Google only allows you to upload photos to albums created by this plug-in (i.e. you cannot upload to albums that you already have on Google Photos). Facebook, in light of the Cambridge Analytica scandal, have prevented small businesses like this one from connecting to Facebook. The official date for this dropping of support was supposed to be 1 Aug 2018, but they seem to have taken action a little earlier. Facebook have not responded to any requests for clarification on their policy for preventing small business access. Unfortunately at this time there is nothing else that can be said except that Facebook have prevented the plug-in from being authorised and therefore have prevented the uploading of photos using the plug-in. 500px have announced that as of this date they will no longer support plug-ins like Photo Upload to access their site. This is a decision made by 500px and not by the plug-in. There is no alternative plug-in available for uploading to 500x from Lightroom. If this decision affects you then please contact 500px directly and mention that you use or rely on the Photo Upload plug-in for Lightroom. I have also contacted 500px. Facebook have announced that on 1 Aug 2018 they are removing the ability for third party applications to create posts on user timelines. Facebook are still allowing posts to be created for Facebook pages. Specifically, Facebook have prevented applications from being granted a permission called “publish_actions” that allows posts to be created on user timelines. Update 20 Jul 2018 – Refer to the news on Facebook dated 20 Jul 2018 above. 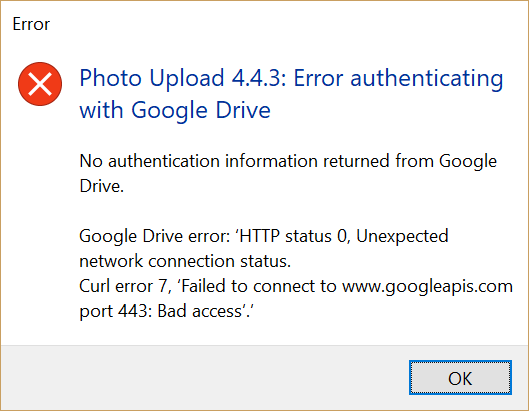 The Picasa Web API that 3rd party apps use to upload and manage photos for Google Photos is giving an error when uploading photos. The error from Google simply says “Internal error, try again later”. Many other people and apps have reported the same errors, for example see this thread (which has nothing to do with this plug-in). There are no indications from Google that this is either a planned outage or a planned change, so at this time I have to assume that Google will fix the problem sooner than later. I will keep an eye on the situation over the next day or so, but there is nothing else I can do at this time. Please be aware that that 12 months ago Google made it clear that Picasa Web was being retired and no longer developed. Sadly, Google do not allow 3rd party plug-ins to upload directly to Google Photos (they can only upload to Picasa Web). My suggestion is that it is time to start looking at alternative photo sites if you want to upload directly from Lightroom. Update 25 Jan 2018 – Google have now fixed the problem and Picasa Web uploads work again. SmugMug have prevented photos from being uploaded to galleries that have their visibility set as “Private”. I don’t know their rationale why and I even asked them why in their support forum, but no reply – https://dgrin.com/discussion/261330/cannot-upload-photos-to-private-galleries-using-v2-api. I’m not sure if SmugMug will fix this or if it is permanent. You need to change the gallery visibility to “Public” or “Unlisted” then the upload should work. Update 28 Jun 2017 – this is now fixed in plug-in version 4.5.7. The Picasa Web API that 3rd party apps use to upload and manage photos for Google Photos has been updated by Google to prevent many update operations. Google have now prevented the Picasa Web service from creating, renaming and deleting albums and from updating or deleting photos. If you are technically minded, please refer to this Google site for more information (see section titled “Mutation support removed”). You can still upload photos using the latest version of the Photo Upload plug-in, and you can use the Google Photos website to create your albums before or after uploading to them from Lightroom. Update 6 Sep 2018 – Google have released an official interface to Google Photos and this plug-in has been updated to support this interface. Please refer to the “Google Photos” service added to Photo Upload version 5.0.9. Google have announced that the old Picasa Web interfaces will be retired in Mar 2019. Please note that Google does not tell the Picasa Web plug-in about any albums you initially create on Google Photos as “shared albums”. To work around this, please initially create albums on Google Photos as regular “albums” and then configure these to be shared albums afterwards. The Picasa Web API that 3rd party apps use to upload and manage photos for Google Photos has been updated by Google to prevent many update operations. Older versions of the plug-in will display “501” errors from Google when trying to perform certain tasks like creating albums. The Photo Upload plug-in has been updated with version 4.1.9 to handle these Google changes with “friendly” error messages. You should update your plug-in to 4.1.9 or later. Please also refer to the note above on “Google Photos (Picasa Web) no longer allow albums to be created”. Update 8 Feb 2017 – this is now fixed in Photo Upload version 4.1.9. The Picasa Web API that 3rd party apps use to upload photos to Google Photos is reporting a “400” error with the message “Bad request”. This will affect all 3rd party apps that upload pictures using the Picasa Web API to Google Photos. There is a thread on the Google forums that is discussing the problem. It is not known what causes the problem and when Google will fix the issue. I’d expect them to fix it quite quickly given the number of 3rd party apps that make use of uploading photos in this manner. I’ll track Google’s response – hopefully it will be quick and positive. Update 28 Jan 2017 – this is now fixed in Photo Upload version 4.1.6. There has been no indication from Google what the problem is, but I’ve found an alternate way to upload the photos which appears to work well. Facebook have mandated a few changes to authentication and old versions of the plug-in will receive a “URL blocked” message from Facebook when authenticating. Update 19 Apr 2016 – this is now fixed in Photo Upload version 4.1.9. Google recently announced that they will be making changes to the Picasa Web API that the Photo Upload for Picasa Web plug-in uses. Google have been unclear about all the implications of these changes to applications such as the Photo Upload plug-in. However they have stated that changes to their API will not be made until 1 May 2016. Google may keep the old Picasa Web API working, with some small changes or limitations. They may replace the API with a new alternative that the Photo Upload plug-in can use. Or they may do something else such as improve Google Drive integration for Google Photos, or remove third party API access to Google Photos entirely. Google have noted that they will announce in March 2016 what the changes will be in detail, so until that time it is not possible to comment further on how Google’s plans will affect Photo Upload for Picasa Web. A few people have highlighted that Lightroom can hang/freeze when it is closing. Lightroom must then be force closed to make it quit properly. In some circumstances a window is shown during the hang that shows the Photo Upload plug-in is shutting down. During some scheduled maintenance on 6 or 7 Oct 2015 Zenfolio have changed the way security for internet communication is handled on their servers. Update 7 Oct 2015 – this is now fixed in plug-in version 3.2.1. Flickr have changed the way authentication is handled on their servers. Update 30 Jun 2014 – this is now fixed in plug-in version 1.7.9. If you think you have a problem, in particular if you think you’ve found a bug, then please make sure you have the latest version of the plug-in. 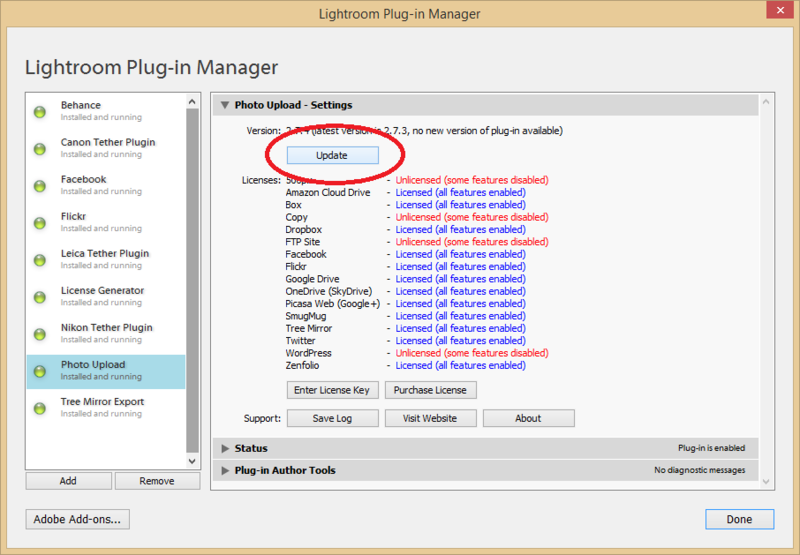 Use the Update button in the plug-in’s settings from Lightroom Plug-in Manager to check that you have the latest. If you download the plug-in from Adobe’s Add-ons website then you will get a ZXP file. This type of file is intended to be opened by Adobe Creative Cloud (and Adobe Extension Manager.) If you don’t have Adobe Creative Cloud then you cannot do much with the ZXP file. Adobe’s add-on installation process for Lightroom plug-ins is really quite complicated – and certainly convoluted. My recommendation for a more straightforward install is to download the plug-in directly from this website. This will be a regular ZIP file rather than a proprietary Adobe ZXP file. And then simply follow the tried and tested installation instructions also on this website. 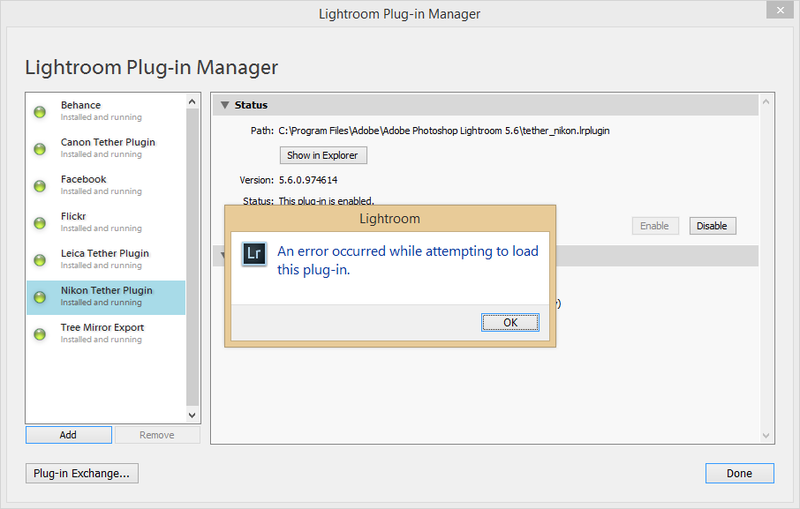 When using Lightroom Plug-in Manager to Add a new plug-in, you may get an error reporting “An error occurred while attempting load this plug-in.“. This error normally means the plug-in folder has not been extracted correctly from the downloaded Zip file. Lightroom expects all plug-ins to have a folder extension of “.lrplugin” or “.lrdevplugin”. When you download a plug-in Zip file from this website, the top-level in the Zip file will be a folder ending in “.lrplugin”, e.g. “photoupload.lrplugin”. You must extract this folder itself, not just the files within it. Once you’ve extracted the plug-in folder from the Zip, you can move it around your computer (e.g. to your Documents folder) but you must not rename the plug-in folder. Lightroom indicates that the plug-in is missing or shows the message “The “nil” plug-in is not installed” if it cannot find the plug-in folder on your computer that you used when you added the plug-in to Lightroom. 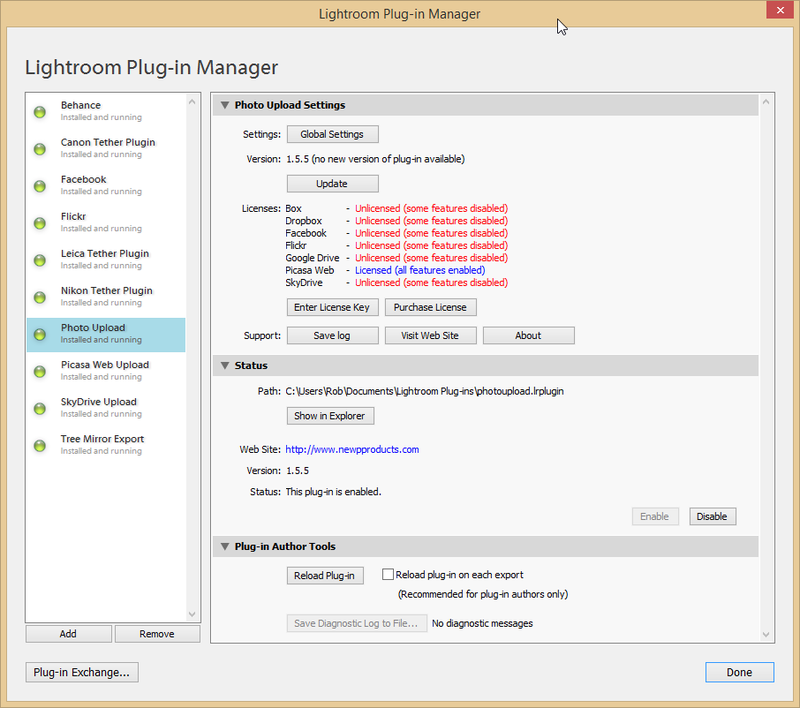 After using Lightroom’s Plug-in Manager to add the plug-in to Lightroom, you must not remove the plug-in folder. Lightroom needs to load the plug-in from this folder each time it starts. If you get this message, please re-install the plug-in by following the installation instructions. No authentication information returned from [service]. The common answer to this is that you are running a firewall (e.g. Little Snitch etc.) and have restrictions on the plug-in’s network access. Consider whether you currently have network problems or are running a restrictive firewall. Most firewalls identify this plug-in’s network access as coming from “curl” rather than “Lightroom”. Please make sure your firewall permits network access for the “curl” application. You can use the “Test Connection” window to test whether your internet connection is working for the plug-in. You can find the “Test Connection” window within the “Configuration” window under the plug-in’s Setting section in Lightroom’s Plug-in Manager. Lightroom provides a setting for the plug-in called “Export Location”. This allows you to specify where Lightroom should create the copy of each photo that you are exporting. Lightroom creates a copy for each photo according to your edits and settings. For example, if you’ve cropped your photo and want to export it as a JPEG then this is what the copy will consist of. I recommend leaving the “Export Location” setting as the default which is “Temporary folder”. This means that the copy of the exported photos will be removed once they have actually been exported. Now that online storage is cheap or even free, people want to upload their entire photo collection. Some people are finding out that when exporting a large number of photos and videos that Lightroom reports that their computer is out of disk space. This problem typically occurs more frequently on systems that have smaller hard disks, e.g. those with 256GB or less SSDs. At the start of a publish/export process Lightroom starts creating copies of each photo that you are uploading according to the publish/export settings you have specified. Lightroom does this in parallel to the actual uploading being done by the plug-in and does not wait for the plug-in to request each photo copy. 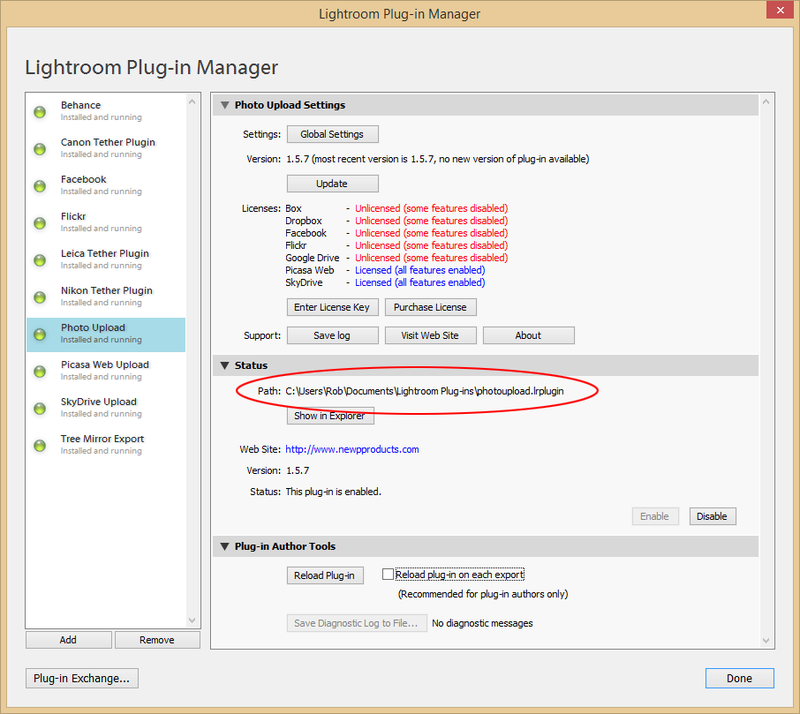 Lightroom does not allow the plug-in to dictate when the photo copies are made and when they are deleted. The out of disk space problem occurs because Lightroom creates all the photo copies at the start of the upload and only deletes the copies when the plug-in has finished uploading the final photo. The photo copies are created in the computer’s temp folder (on a Windows machine this is usually on the same drive as the main Windows installation, e.g. drive C:). You will need enough space in your temp folder (and drive) to allow Lightroom to create publish\export copies of all the photos that you are uploading in one operation. The space used by Lightroom during the upload will be freed up once the upload has finished. e.g. If each exported photo that is generated by Lightroom is 5MB in size, and you are exporting 1,000 photos then you will need 5GB of free space in the temp folder on your computer. Note: A work around for this Lightroom problem is to use the plug-in’s “Generate exports one at a time” setting. Various online services (e.g. Picasa Web) can make use of the photo location information in the photo’s metadata. If the location information is not being uploaded then check that you have enabled location information in Lightroom’s Export/Publishing Manager windows, i.e. you do not have “Remove Location Info” checked. Update your Photo Upload plug-in to a newer version (version 2.3.7 or later). Microsoft appear to have changed something on their servers which requires an updated Photo Upload plug-in. Use the Update button for the Photo Upload plug-in in Lightroom’s Plug-in Manager to get the latest version. Note: If you are still using the old SkyDrive Upload plug-in then please take this opportunity to upgrade to the Photo Upload plug-in (your existing license key will still work). The Photo Upload plug-in works with blogs hosted on wordpress.com and blogs that are self-hosted. Authentication is always managed by wordpress.com, so you will need an account on wordpress.com even if you do not have a site hosted there. For self-hosted sites, you will need the Jetpack WordPress plug-in on your WordPress site. Ensure that you have version 3.1 or later of Jetpack installed. Version 3.0.2 of Jetpack had an error that prevented authentication. This Jetpack error was fixed in 3.1. The plug-in cannot be authenticated with sites hosted locally at “localhost”. Authentication needs your WordPress site to be registered and accessible by wordpress.com. WordPress does not allow such local sites to be registered. WordPress allows you register multiple blogs with your wordpress.com account. You can select from your available sites using the drop down list in your Web brower when authenticating the plug-in with WordPress. 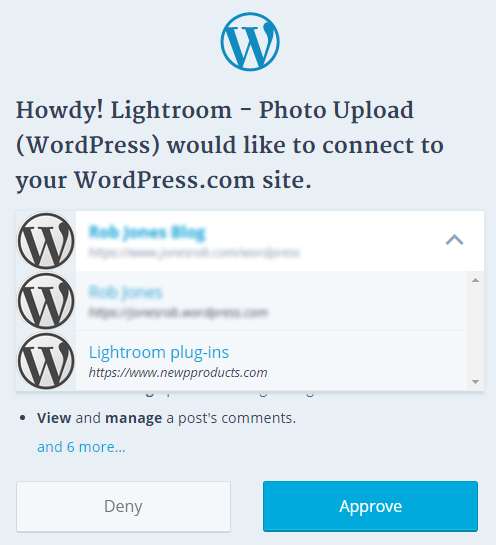 Sometimes WordPress plug-ins can prevent the Lightroom plug-in from authenticating with your site. These plug-ins prevent you receiving an authentication from WordPress, i.e. the page with the authentication code does not open in your browser. If you do not receive an authentication code in your browser please disable the security plug-ins and try the authentication again. You should be able to re-enable the plug-ins after the authentication has successfully taken place. E.g. “Lightroom Version 5.3.0.938183 is incompatible with this plugin“. You have an old version of the plug-in. If your plug-in has an Update button then use that to update to the latest version. If your plug-in does not have an Update button or you are having problems using the Update feature then simply download a new version from this website and manually replace your existing plug-in. If you have the old Picasa Web Upload plug-in then please download the Photo Upload plug-in which now replaces it. Your old Picasa Web Upload license key will work with the new Photo Upload plug-in (for the Picasa Web service). If you have the old SkyDrive Upload plug-in then please download the Photo Upload plug-in which now replaces it. Your old SkyDrive Upload license key will work with the new Photo Upload plug-in (for the OneDrive service). If you have the old Tree Mirror Export plug-in then please download the Photo Upload plug-in which now replaces it. Use the Tree Mirror service in the new Photo Upload plug-in. To remove the plug-in from these locations you have to manually remove the plug-in folder from the appropriate path. If you purchase a license for the full version of the plug-in you will be sent 2 emails. One email will contain your order number and the second email will contain your license key. These emails will be sent to you immediately and automatically by the FastSpring payment service. The license key email should be sent immediately – but on a few occasions it has taken 6 hours before it has been received. If you think you should have received an email but have not received it then please first check your email junk or spam folders. The license keys and order receipts are sent by FastSpring – so it may help to search your junk/spam email folders for the name “FastSpring” or “mailer@fastspring.com”. A private\corporate email domain is not processing the email correctly (sometimes the license key emails are identified as junk\spam). The most reliable email addresses tend to be from mainstream domains such gmail.com or live.com. An incorrect email address being entered during the order. If you think either of the above apply then please contact FastSpring (support@fastspring.com) with your order number. If the above tips for finding your license key have not helped, AND you bought the plug-in from the Adobe website (i.e. not via the plug-in or this website) then you will need to contact Adobe for further assistance. Please note that, as the plug-in developer and not an Adobe employee, I cannot access the payment and licensing systems used by Adobe. Therefore if you have purchased your license key from the Adobe Add-ons website you will need to contact them regarding any unreceived license keys. Here’s a thread on the Adobe forums that gives the email address to contact that another customer was given. If you’ve bought your license from this website and lost your license key then please use the email address on the Contact page to get in touch. Please provide the reference number for your original purchase or the email address that you originally used. If you’ve bought the license from the Adobe Add-ons website then you will need to contact them to have your license key sent out again. When copying and pasting your license key from your license email into the plug-in, take care that the key is copied as one long list of characters. Your email system may insert line breaks or spaces into the email, so please be sure that any such line breaks, spaces or other formatting from the email message are not pasted into the plug-in’s license text box. If your license key is still reported as being invalid after copying and pasting it then please check you have specified the License service correctly in the license key entry window. e.g. If you have purchased a license for Dropbox then please make sure Dropbox is the selected License service in the window. A common mistake is trying to enter a Google Drive license key for Google Photos. Please be careful when purchasing licenses and entering the license keys that you have selected Google Drive or Google Photos correctly. On Mac, if you open (i.e. extract) the downloaded Zip file a second time you will get a folder with the suffix “2”. Lightroom will not be able to read the plug-in from such a named folder. Before opening the Zip file consider removing an existing plug-in folder. The Picasa Web plug-in uses Google’s Picasa Web interface to upload photos to Picasa Web and Google Photos. The Picasa Web interface has a restriction of a maximum photo size of 2048 x 2048 pixels if photos are not to be counted towards your allowance. Please note that Google currently only provides “unlimited high quality photos” via its own mobile apps and website. Google does not allow any third party applications such as the Photo Upload plug-in to use those constraints. The old “Picasa Web Upload” plug-in has been replaced by the “Photo Upload” plug-in which allows you to upload to Picasa Web and many other services. If you have the old Picasa Web Upload plug-in then please note that this is not available for use with the latest versions of Lightroom. Instead please download the latest Photo Upload plug-in from this website. You can use your existing Picasa Web Upload plug-in license key with the Photo Upload plug-in. If you want to use the Photo Upload plug-in with multiple services (e.g. Picasa Web and Google Drive) then you create additional publish services by right clicking on an additional publish service and choosing “Create new publish service…”. You can then choose a new upload service, account and settings for this additional publish service. You may need to check which version of a plug-in you are using. You can do this from Lightroom’s Plug-in Manager. Select the plug-in on the left (e.g. Photo Upload). 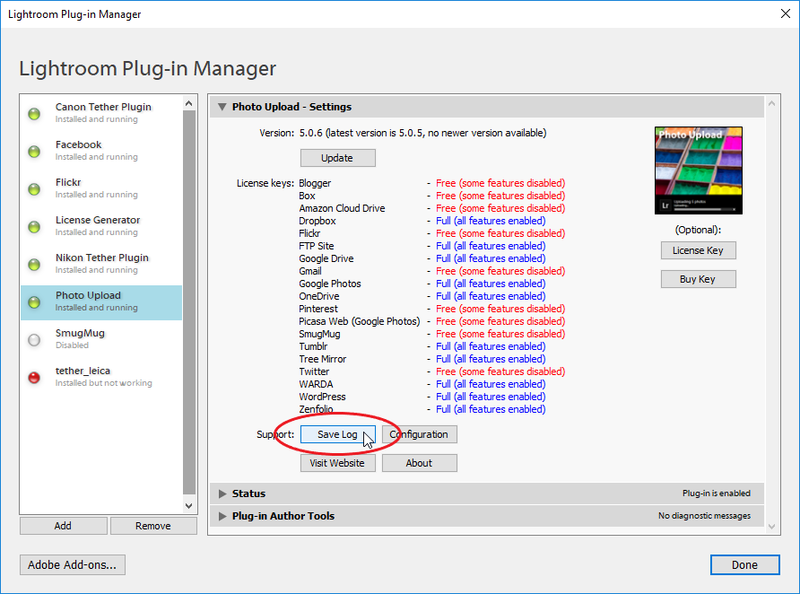 The plug-in version number is displayed on the right in both the plug-ins Settings and Status panes (in the example below the version is 1.5.5). Sometimes you may need to remove your plug-in, perhaps to replace it with a newer version. Lightroom’s Plug-in Manager allows you to unregister a plug-in from Lightroom using the “Remove” button, but in most cases I recommend actually deleting the plug-in folder from your system. This is particularly important if you are upgrading the plug-in with a new version – always delete the old plug-in folder first so that there is no doubt which version of the plug-in Lightroom will be using. You can find the installation folder of your plug-in from Lightroom’s Plug-in Manager. To remove the plug-in simply identify the install folder (highlighted in the above Plug-in Manager screenshot). You can then delete it using either Windows Explorer or Mac’s Finder. You can use Lightroom’s Plug-in Manager’s “Show in Explorer” or “Show in Finder” buttons to go straight to the folder, making it easy to find the plug-in folder on your system. 1. Do the activity that doesn’t appear to be working, e.g. try uploading a photo. This is important so that the problematic behaviour is recorded in the log file. 2. Save your plug-in’s log file. From the “Plug-in Manager” window in Lightroom, select the “Save log” option from the plug-in’s settings section of the window. 3. Email the log file to me. Attach the log file from the place where you saved it into an email and send it to me. I’m not sure if this is the right place, but here goes. I’m successfully uploading photos to Google Photos (and before Picasa Web). My issue is in trying to set up the parameters so they upload to Googles megapixel size (HQ). I set it up for 16mp on the upload settings but the photos are still too large, and I have to go to Google Photos and re-compress. Is there a setting we can use? Or maybe have a “button” to select Google HQ size for uploading? 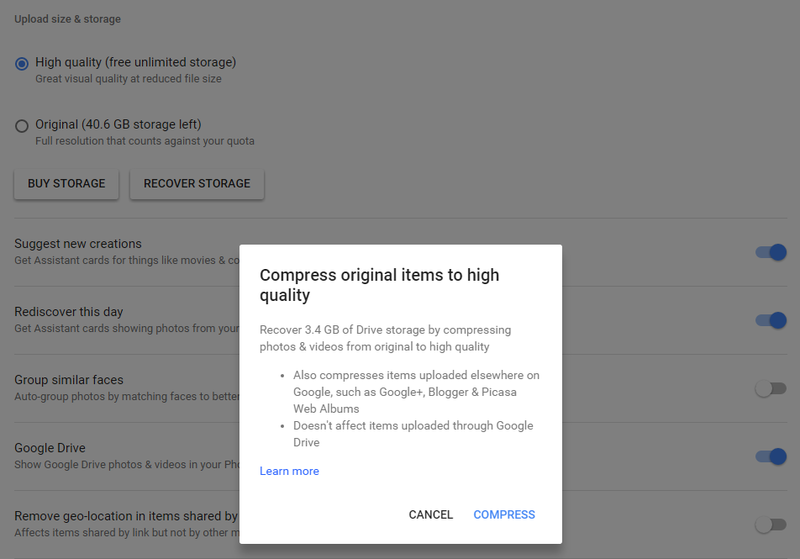 You will need to use Google’s “reduce size” capability to free up storage space periodically. Struggling recently to upload videos to Flickr and not sure i can find the authentication key i bought some time ago or i would remove photo upload and reinstall. anyway, i am getting an error on all videos. the error is below. thoughts? thanks in advance for the help. All I can suggest is that we wait a short while and hope that Flickr’s migration completes and the service successfully resumes again. Any chance you can support going to another Publish Service? I’m trying to get an old structure moved over into TTG Publisher, and thought I had found a way here until I looked at the fine print. Plug-ins such as Photo Upload fit into the publish service framework provided by Adobe Lightroom. 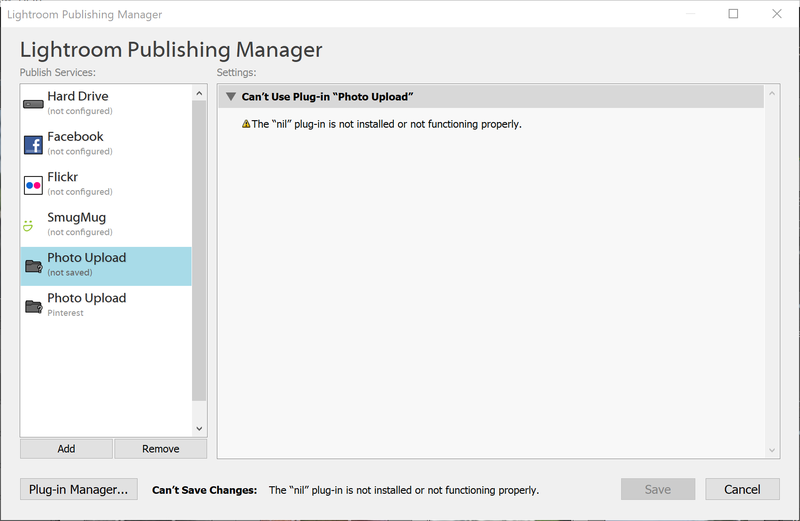 Unfortunately Adobe does not support moving collections between different publish services, so the plug-in is not able to help with this operation either. No complaint – just kudos. I had purchased licence for the Google Photos plug-in, and used it successfully several months ago. Now time to update online photos, and I could not get it to work. The list of albums on GP would not properly download to the Lightroom plug-in. Lots of frustration until it dawned on me to look for an update. Indeed, an update was available (5.2.6), so I installed it. After restarting LR, I tried creating a new GP album directly from the plug-in (which I believe always failed with earlier version). Woo hoo! it worked! So now I have created a bunch of new GP albums directly from LR, and uploaded the photos, just as I had hoped. Thanks very much for a great product. Hi, I always get an Error 500 Internal Server Error, from Google Photos when trying to upload photos in a new album (collection). I searched your logfile and could only find the 500 Error, nothing more..
You found a bug in the plug-in. It’s now fixed in the latest version of the plug-in and you’ve confirmed this works for you. Hi Guys …… on the Pinterest uploader is there any way of choosing which board it is uploaded to at all ? Of course. If you’re publishing you can right click on the published collection in Lightroom, choose “Edit Collection…” and then select how you want the published collection linked to whatever on Pinterest. Working on a PC. Loaded the plugin, went to upload to Gmail. Process seems to work. Got the size warning for the free version. Exported and it just opens up my gmail and that’s it? After the size warning, and depending on your settings, the plug-in will typically open a window allowing you to type a message in (or pick up some metadata for the message from Lightroom). Then after creating a draft email on Gmail with the photo attachments, the plug-in will open the draft email in your browser. You may have spotted a bug where just Gmail was opened and not the message itself. This bug is now fixed in version 5.2.2, please use the Update button to get the latest version. I have an issue with Google Photos upload. I only used it once uploading 79 photos and now I have the quota error message but for an “ApiCallsPerProjectPerDay”. Is it the same issue as mentioned here or a new one? The product is useless to me if I have these messages. Google have now (18 Dec 2018) increased the number of interactions the Photo Upload plug-in can make to Google Photos in a 24 hour period. This should prevent you seeing the “too many requests” messages you were seeing. Thanks for highlighting this. Photo Upload v 5.1.8 settings issue. Yes I quit LR and it does say that I’m using 5.1.8, I uploaded a scene capture to the URL below. I think you’re referring to the plug-in for Amazon Drive? There are 5 items from the full list that do not apply to Amazon Drive. Four of the “missing” items are associated with looking up photo names and Amazon Drive does not have the concept of photo names, just photo file names. The final “missing” item is to do with duplicates – Amazon Drive does not allow you to upload two files with the same file name, so you can’t create duplicates. Foolish question about Tree Export: The documentation describes how to use it to copy a folder hierarchy of pictures to one’s hard disk–but is there a way to copy a collection hierarchy to hard disk via a publish service. I understand that one can export it, but that won’t keep the destination up to date the way a publish service will. I found the Tree Mirror tool (Photo upload + Tree Mirror 5.1.8), downloaded and installed in LR (version 2015.14). selected a source base directory and set the destination directory to a sub-folder of the base directory and started export. I get all time the following error. The message “Photo folder ‘C:\\’ must be in the same folder or a sub-folder of the Source base folders” means that your photos which are stored on C:\ are not in a sub-folder beneath whatever folder you set as your source base folder. You didn’t say what you set as your source base folder. thanks for the quick response. The origin question in this blog was scrambled/cutted a bit the name of my source folder, I had placeholders used. My laptop has Windows 10 installed. My user is an AD user (company account). below there are some subfolders with pictures. In LR UI I also selected the “GH3-Neu” folder. So my understand is: I get a copy of the GH3-Neu and subfolders into the GH3-Neu\TreeMirror folder (related to the outer settings of the image quality etc.) My understanding of the user guide, this is a valid task or? Plugin Authenticated Status shows as OK. Test passes. error message is lengthy. says too many requests resources exhausted quota exceeded for quota metric Same if I try to upload one or 25 photos. until three weeks ago the upload to PicasaWeb with my GSuite account worked. Now i get “intern error Service_PW.lua:126 : bad argument #1 to ‘ipairs’ (table expected, got nil)”. I bought your Google Photos plug-in, same problem. Then I used the plug-ins with my private gmail account and the plug-ins worked. The plug-in could not retrieve the email address associated with your Google account. Not sure if you don’t have an email address assigned, or perhaps you haven’t granted the plug-in access to your email address. The email address is used to differentiate between multiple accounts with the same name. Either way, the plug-in shouldn’t crash. I think I’ve now fixed this in version 5.1.7. Can you use the plug-in’s Update button to get the latest and let me know how you get on? thank you for your advice. Export works again with version 5.1.7. I did use 5.1.5. After resolving problem with TreeMirror as mentioned in previous message, I realized that your plug-in also manages publication to Google Photos. I am currently migrating from Flickr to Google Photos because of their TOS changes, and I wanted to maintain the album structure that I had in Flickr. Had tried several other plug-ins from other authors, but none could create the album structure that I wanted. Tried your plug-in, and was pleasantly surprised that it worked exactly as expected. Played around a little with the free version, then purchased a licence. Well on my way to migrating everything from Flickr to Google Photos. Just a quick “thanks”. I was getting frustrated when trying to export to the hard disk – was constantly running into errors when a file already existed and it should have been overwritten. I was having to delete the file manually from two different locations. Ughhhh…. Finally dived in to find the problem source, and realized I was using an old version of the plugin (v 4.6.3 if I recall correctly). Reading the FAQ, I realized there was an “Update” button which seamlessly downloaded the 5.1.5 and installed it without fanfare. Tried to trick the new update into failing same as before, but it handled every curveball I could throw at it. Well done!!! I don’t see this issue in any other comments so far. When attempting to export to Dropbox I get a message saying “invalid account settings, please check your account settings for this plug-in”. So I go to the plugin manager and it says successfully installed and status enabled. From the Photo Upload 5.1.4 Configuration window if I click “test connection” everything passes. I don’t know what else to check nor what “account” I’m supposed to check. Please help. In the “Photo Upload – Account” section of the publish settings\export window, you need to add your Dropbox account. Use the Add\Refresh button in this section to do this and follow the instructions. This will link the plug-in to your Dropbox account. Keywords can be uploaded as labels (I’ve done a quick test and they were uploaded fine – perhaps make sure your export metadata settings allows all metadata to be exported). The problem is that Amazon Drive doesn’t allow you to view the labels anywhere. The same issue applies to photo description\summaries. I’m not sure why Amazon allows apps to upload labels and descriptions if you can’t view them later. Perhaps Amazon will add this capability in the future? Is there a way to create a Google Photos album by folder? e.g. I select photos from “Beach 2018” and “Mountain 2017” folders. I’d like albums with the same names created on Google Photos. Yes. In the Settings, choose “Sub-folder names” and the value “Last”. Also choose “Export sub-folder hierarchy” and “Export from folder”. This will then make a list of all folder names that your photo is in and just use the last one for the name of the album on Google Photos. Also, in settings, it appears that none of my existing (not shared) album names are returned in the album pick list. This message comes from Google and only affects some people, some of the time. Google have not documented any bytes quota limit. Frustratingly this behaviour and message is affecting many different applications that are using the new Google Photos interface. The situation has been reported to Google and assumed at this stage to be a bug – https://issuetracker.google.com/issues/115932469. Hopefully Google will address this soon. But in the meantime, if you’re affected by this message, the only answer seems to be to try again the next day. Bizarrely (presumably for security reasons), Google Photos does not allow apps to upload photos to any album that was not created by the app. So only albums created by the app are displayed in the plug-in. Google today say they have fixed the problem in their configuration that was causing the “429 Too Many Requests” error. Can you let me know if you still experience this problem and if so I can pass the message on to Google. Hi, just bought the Photo Upload plug-in for LR 4. Also, is there an option of including a caption with each photo (using the metadata title) – as was possible with the Flickr plug-in? Thank you. You can use the plug-in “Settings” to specify the photo summary to use for each photo caption\description. When attempting to upload photos to Google Photos using version 5.1.4 of the plug-in, I get the following error message: Google Photos error: ‘HTTP/1.1 429 Too Many Requests, Code = 8, Message = Quota exceeded for quota metric ‘photoslibrary.googleapis.com/total_upload_bytes’ and limit ‘UploadBytesPerDay’ of service ‘photoslibrary.googleapis.com’ for consumer ‘project_number:354491581110’.’ (14) Some of the photos are successfully uploaded, but not all. When I attempt to upload a second time, the plug-in hangs. Is there a daily limit to what can be uploaded and, if so, is there a workaround? While I originally replied that the problem seemed to be fixed, it now appears again on a regular basis (Too Many Requests). HTTP/2 400 , Message = We’re sorry, but the value for field title was not valid. You found a bug. The Blogger title field was having issues with “< " and ">” characters. This problem is now fixed in plug-in version 5.1.4. Please use the Update button to get the latest version. I’m using Photo Upload 5.1.3. Is there a way for the plug-in to remember which Amazon Cloud folder was used last when you use Export With Previous? It seems to default to the top of the alphabetical list: A. The answer is “no”. Instead when exporting, select “Recent folder where other photos were uploaded to” which contains the most recent 10 folders you’ve uploaded to. These recent folders are ordered by date you used them, so just select the entry which shows the last used folder. your plugin in the latest version 5.1.1 is not compatible anymore. Could you please let me know by when a new version is available ? New version compatible with Lightroom 8 is now available – your message beat the update being available by seconds. It also takes about 5 minutes every time to publish/republish photos to that service. Google only allows apps and plug-ins to upload to albums that they have created (and not to albums that they have not created). If you create a new album using the plug-in then this will then appear in the list the next time you show the list. Hi, I’m getting this message constantly and am unsure how to fix it. Tried various settings but it always pops up. It’s a bit confusing as I’m publishing from a smart album that is set to “Lightroom only”. You will have the setting called “Export sub-folder hierarchy” turned. You should turn it off, as it is not applicable when publishing from a smart album. From your publish service, right click menu “Edit settings” and then use the Settings button to open the plug-in settings. How do I upload all collections into the base folder using FTP? The folder structure always gets reproduced, and I don’t want that to happen. If the folder structure is always being reproduced then it’s because you’ve turned on “Export sub-folder hierarchy” in the plug-in’s settings. Try unchecking that setting. I’m pretty sure WordPress does not support keywords for photos. Have I missed something that has enabled keywords? I’ve just noticed that the plugin doesn’t upload all the keywords in a keyword hierarchy when publishing to Zenfolio (maybe any online service, not sure). It exports the lowest level keywords but not the parent keywords even though they’re set in Lightroom to be exported. Is this a bug? Can it be fixed please? Currently using plugin version 4.9.9 and Lightroom Classic CC version 7.3.1 on Windows 10. Yes, you’re correct – it was an oversight. This is now corrected in version 5.0 – many thanks for highlighting this and helping confirm the fix works as intended. The upload file size seems to work strange. When i limit to 20’000 K the file size will be larger, when the Compression rate (which is then unmarked) was set before to 90 or 100%. I prefer to use only the file limit. As the help says it would use the best JPG Quality for that file size. I can remember that this has been working in earlier versions. Can you give me detail information about that situation. The settings you are referring to are Lightroom settings and the behaviour is entirely Lightroom’s. The plug-in does not control them in any way. If you exported the photos to hard disk then you would get the same behaviour. You may need to raise this question with Adobe if you need an answer. It’s interesting that the behaviour has changed though – I had not noticed that. I recently purchased a key and using your Tree Mirror plugin. I have no complaints, it’s working great but do have a suggestion to improve the functionality of the plugin. In the Tree Mirror Account Settings, Export to Folder, I would love to see a way to include the collection name/collection set hierarchy in the Destination Base Folder path. I’m using the plugin to create copies of collections to be read by a media server that is rather limiting in its ability to organize media so I’m relying on directory structures to keep things organized. It would be very useful if the service were able to create the destination directory folder structure based on the collection set naming structure. At this point I’m having to create separate publish services for each of the collections that I want to export into a collection named directory and soon I’m going to have more services than I can maintain. It would be excellent to be able to keep all of the collections in the same service! Thanks for the suggestion. This capability is now available in v4.9.8 – see the setting “Export from publish service”. It then inserts a value of 170. The resolution setting is actually a Lightroom setting, not a plug-in one. I had a quick look on Google and found this info, not sure if helps. If not, you’ll have to contact Adobe as this will effect all exports and publishes from Lightroom. We can remove the plugin, but is it possible to clean the catalog that has been modified by Photo Upload? Could it be a problem to use such a modified catalog with a future release of LR (“catalog corrupted..”) or it is impossible? Thanks a lot, this plugin looks great! The plug-in tells Lightroom what metadata it wants to store with each photo and Lightroom makes this happen when you install a plug-in. But there is no facility to remove the metadata when you remove the plug-in. Lightroom is very careful to keep the plug-in metadata separate to the Lightroom data and I’ve never heard of any problems with corrupted catalogs. I just started my trial of this promising plugin. I was already using 500px and uploaded some photo’s manually (or through another service like IFTTT). Is it possible to have this plugin match the existing photo on 500PX and “just refresh” them and not offer just the options of update / delete / skip? The plugin does not match up existing photos that have not been uploaded by the plug-in, I’m afraid. Doing so is quite a difficult to get 100% correct. Upload to Amazon Japan Cloud Drive? Upload works fine to Amazon.com but can this be set to use for Amazon Japan where I hold my Prime account and where I want to back-up my photos from Lightroom? All Amazon authentication goes through amazon.com. You should be able to enter your own regional amazon login details (including for Japan). I don’t have an amazon.com account and can successfully use my regional variant. I have trouble with uploading to Zenfolio for a while (6-9 Month). It creates a gallery but dont upload a picture. No error is shown, it just stop the upload-try after some minutes . It turns out that you were using JPEGmini and that an update to that plug-in caused an error. Disabling JPEGmini allowed the photos to be uploaded again. Thanks for sharing the update. Regards, Rob. I love the plugin with all it´s possibilities. There is an option to delete old pics on upload, but it seems to only delete pics that have the same name as the new uploaded ones. For my workflow I need an additional option to delete all pics in the specific folder of the FTP before uploading the new pics. I use a prefix for sorting + filename and I have to manually delete all pics if I want to change the order of the pics. The pics on my FTP dynamically feed the content of my website. It would be nice if you could consider implementing such an option. There’s now a new option called “Delete everything in album” for the “Existing photos and videos” setting. This will do what you request. Thanks for raising the request and testing that it works correctly! Thanks, Rob. Hi, I would like to install two versions of Photo Upload (for both of which I have a license): one for Dropbox, the other for Google Drive. When I install the second version, the first one deactivates. Is there any possibility of keeping them both active? Assuming you’re using publish services, you want to right click on your Photo Upload publish service and choose “Create another publish service via…”. Regards, Rob. 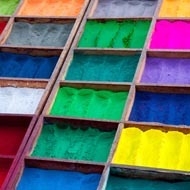 Hi, have installed a test version av Photo Upload. In LR I created a smart collection and uploaded the images to Google Photos. However, no album was created in Google Photos which I expected. Only images were uploaded. Do I have to create albums in Google Photos myself? Correct – Google do not allow third party apps like this plug-in to create albums any longer. Hi and thanks your reply. However, if I create an album in GP, the “Export-way” of the plugin can find that album in GP. This cannot be done, from what I can understand, in the “Publish-way” of the plugin. You can create a new collection in your publish service. Edit that collection and choose “redirect” and link it to your album on Google Photos. There are no indications from Google that this is a planned outage or a planned change, so at this time I have to assume that Google will fix the problem sooner than later. Google seem to have fixed the problem now. I get: Picasa Web error: ‘HTTP/f1.1 500 Internal Server Error, Internal error, try again later’ (1). Hopefully Google will fix this soon – they haven’t announced any changes that should have caused this problem, so I have to assume it is temporary. The Smugmug plugin doesn’t work correctly with the most current Lightroom update. The folder (redirect to existing gallery on smugmug) reverts to the top of the list and will not save to the original folder. Yes, you found a bug in the SmugMug part of the plug-in. Now fixed in the latest (v4.9.1). Sorry for the problem and thanks for reporting it. I would like to use your plug-in for Zenfolio using LR5 on my Macbook. Is your plug-in compatible with LR version 5.7 and Mac OS x 10.7.5? Thanks so much for your speedy response. I will get to this soon. I have a request for a feature enhancement to your Tumblr plugin. It would be nice to be able to add a set of boilerplate tags to every posting. In this case, not the tags one might have on an image but an additional set of tags. For example, I’d like to add “Photographers on Tumblr”, “Original Photographers”, “luxlit” and a few other tags to *every* posting I make but I don’t want these tags in my Lightroom catalogue. Also, these tags need to be the first tags on a posting, not alphabetically placed. It would be cool if you could add this to the plugin somehow. This has now been added to the plug-in in version 4.8.7. Using the Settings window you can specify “Extra keywords” and choose how they are mixed in with the actual photo keywords. Thanks for the suggestion and your help testing the new feature. Does “Onedrive” plugin license support “OneDrive for Business” I want to use professional domain for exporting. Yes, the OneDrive plug-in supports OneDrive for Business. Please give the plug-in a try before you buy to make sure it works the way you want – and get in contact if you have any further questions. Is it possible to increase the number of characters from 140 to 280 for twitter please? The plug-in simply displays a note if you use more than 140 characters. You can currently create a post with up to 280 characters. However I’ll make sure the note is updated to show 280 characters in the next version of the plug-in. I didn’t buy this plug-in all that long ago and it worked, but now it’s broken. You found a bug, apologies! Now fixed in version 4.8.5. Thanks for raising this issue and testing that the fix works.